Brighton & Hove Albion have signed defender Connor Goldson from Shrewsbury Town for an undisclosed fee. The 22-year-old centre-back has signed a four-year contract with the Seagulls. Goldson, who came through the Shropshire club's youth system, played 120 times for Shrewsbury after being given his first-team debut by then Town boss Graham Turner in February 2011. "We are delighted to bring someone with Connor's ability and potential to the club," said Albion boss Chris Hughton. 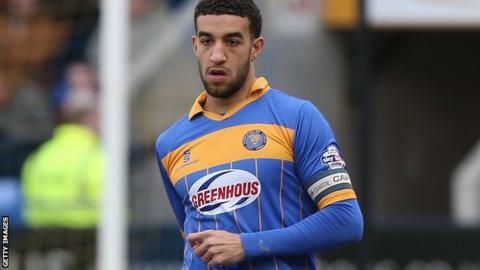 Connor Goldson is the second Shrewsbury youngster to leave the club for a Championship side this summer, midfielder Josh Ginnelly having joined Burnley for an undisclosed fee on a three-year deal. "We know he had a lot of admirers in terms of other clubs, so we are thrilled to complete the deal. "I have no doubt he has the talent to step up into the Championship after performing well in both League Two and League One. "He has been a regular starter for Shrewsbury at such a young age and I think he has the temperament and quality for Championship football." Goldson becomes Brighton's 10th signing of the summer transfer window.